Kasauli, 1885. The General's House. bl.uk > Online Gallery Home	> Online exhibitions	> Asia, Pacific and Africa Collections	> Kasauli, 1885. The General's House. 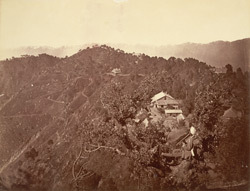 Photograph of Kasauli, from the Macnabb Collection (Col James Henry Erskine Reid): Album of miscellaneous views taken in 1885. Kasauli is a Hill Station in Himachal Pradesh, situated on the summit of a long ridge overlooking the Kalka valley at an elevation of 6,335 feet above sea level. In 1842 a European military cantonment was founded here and it also became a convalescent depot. This view shows the General's House and in the foreground an Indian man sitting in a tree playing a wind instrument.